Apartment in villa of recent construction made with quality finishes not far from Assisi. A beautiful well-equipped four-room apartment of 180 square meters located on the ground floor with private entrance, a large private courtyard of 100 square meters with panoramic views, gazebo with table, bench and outdoor chairs. Ideal apartment for extended families or groups of friends. It includes three bedrooms, a large living room, a well-equipped kitchen with back kitchen, pantry and laundry. N ° 2 very spacious and bright rooms with windows overlooking the valley, can be set up with King-Size double beds (200x180 cm) or with single beds (200x90) bedside tables with lamp, a spacious wardrobe with two solid wood doors, desk and seat. The bathroom available in each room has a window, sink and mirror, toilet, bidet, 160x90 shower cubicle with glass doors, washing machine, hairdryer. N ° 1 Bedroom with two single beds (190x90) and possibility of preparation with double bed, private bathroom with shower furnished like the other rooms. The very spacious living-dining room of 80 square meters has a dining area that can accommodate up to 24 people, a sitting area with three sofas, one of which is a bed, armchairs, a large wood-burning fireplace, a 50 "HD television with satellite dish , anteroom with sink and a bathroom with toilet and shower. The excellently furnished kitchen has a large central island with capacious drawers, worktop (200x120) stools, large fridge and freezer column, kitchen unit with five-burner stove, sink with double tub, dishwasher, electric oven, electric boiler, toaster . There is also a pantry and a laundry with sink, washing machine, clotheslines, ironing board and iron. The apartment is delivered complete with bed linen, bathroom and kitchen with weekly change. Upon your arrival you will be given the credentials for fast Inrnet WiFi access both inside the apartment and in the common outdoor spaces. The villa is set in a context of rare scenic and natural beauty. Six hectares of land completely fenced between the regional park of Mount Subasio above Assisi and the nature reserve of Colfiorito. The very comfortable and well-maintained house was rebuilt in 2010, trying to maintain the pre-existing farmhouse style, adopting anti-seismic criteria and solutions aimed at energy saving and environmental protection: solar panels for hot water sanitary production, photovoltaic panels for the production of electricity (10 kw), thermal insulation, drip irrigation systems in the garden. The swimming pool with a beautiful 15 m long pool, 6.5 m wide and 1.5 m deep, is equipped with a solarium, a hot shower, sun umbrellas and pool loungers. The refreshment and barbecue area with tables and chairs, is highly appreciated by our guests for wine tastings, typical products and grilled appetizers. At a fair distance from the house to ensure privacy and silence, there are play areas and activities: swing, slide, ping-pong table and archery and a small animal farm. The villa is only 2 km from the historic center, where many essential services are available: bar, pizzeria, pubs, restaurants, small supermarkets, butcher, tobacconist, petrol station, newspapers, pharmacy, and other services. Thanks to its delightful location and excellent communication routes you can reach the main tourist centers of Umbria by car: Assisi, Foligno, Spello, Spoleto, Gubbio, Perugia with journey times varying from 15 to 45 minutes. A world of greenery and peace, a warm hospitality, a good opportunity to discover Umbria, a land rich in art, history, culture, exquisite cuisine and fine wines. We LOVE AND RESPECT the nature that surrounds us, for this we pay particular attention to the preservation and respect for the environment. LOVE AND RESPECT our guests, for this reason we devote full attention to continuously meet their needs and exceed their expectations. 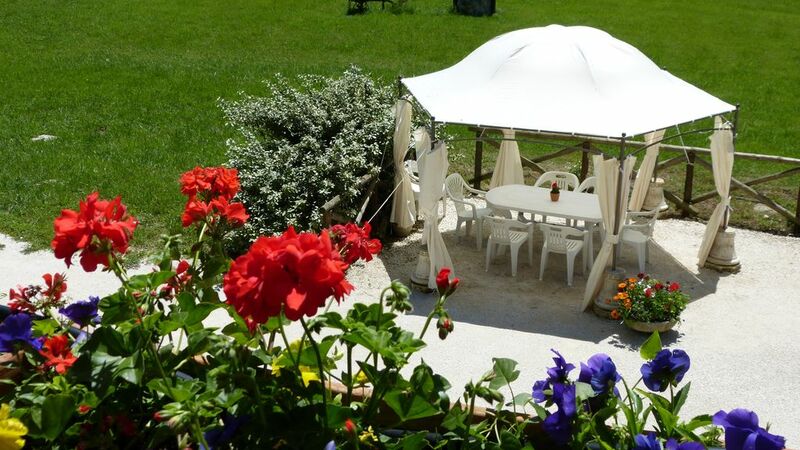 Please invite your friends to spend an unforgettable holiday in Umbria and a warm welcome to Cerqua Rosara Residence! Thank you Gianni for the most beautiful stay. The property sits of the beaten track so it's perfect for getting away from it all, it has everything you need also to make your holiday a relaxing enjoyable experience.. it is also perfectly positioned should you wish to tour, maximum time spent in the car to reach any tourist destination is 45 mins. We highly recommend this property. Gianni is the perfect host. We had a fantastic stay in the ground floor flat. Although it was hot outside, the flat was always nice and cool without any fans. Giovanni is an excellent host and really cares about the well being of his guests. He loves children and took the kids to feed the animals almost every day. They also host a dinner for all the guests which is amazing! Would definitely go back! Hi Liezl, thankyou, It was really a pleasure to guest you and the chindren! Relaxing, beautiful countryside with an amazing host! We loved our stay in Valtopina. We have been to Italy several times but this was our first visit to Umbria. Giovanni did an excellent job of understanding our interests and suggesting amazing hill towns to visit and restauarants for our family. One afternoon he took us to his hometown and gave us a tour. The grounds at Cerqua Rosara are in perfect condition. We would tour during the day and come back for a relaxing swim and hang out at the property until dinner. The house was very clean and the 3 bedroom was more than what we needed for a family of 4 but we enjoyed the space and the pricing was very reasonable. We will be back! Thankyou very much for your review, it's has been indeed a pleasure to guest you and your dear family! I'm happy you liked our accomodation, we always pay very attention to our customers satisfaction and we do all our best to go over their aspectations: comfort, relax, beatiful of our apartaments, swimming pool, wide green outside, areas for arch, ping pong, barbecue, little farm. I really hope to meet you again and to let you discover our green Umbria rich in art, history, culture, wine and food! The most magnificent hideaway in Umbria. Our family arrived to the most wonderful welcome from Giovanni, our host of Cerqua Rosara. We rented the apartment with 3 bedrooms (all ensuite), full kitchen with all the amenities, beautiful living room with fireplace and dining area that could seat 12. Everything was impeccable and well maintained. We have 3 girls ranging in age from 4-12 who absolutely loved all the farm animals and had so much fun picking fresh eggs every morning for breakfast, playing with the dog, Layla and petting the baby rabbits and chickens. Riding the donkeys was another great experience and lasting memory that they talk about all the time. Even though the pool wasn't yet open, there was so much to do. Giovanni could not have been more hospitable. He gave us a personal tour of the Region bringing us high up into the mountains on excursions that we would never have done on our own. We eat in great restaurants and even cooked out on a BBQ one evening on the property. Cerqua Rosara is 1/2 hour (or less) to Assisi, Norcia, Spello and other great places to visit in the Umbria region. I would definitely recommend this place to anyone who is looking for a little piece of heaven. Our only regret was that we didn't stay longer. We will definitely be back Giovanni, thanks for everything. Ciao! Dear Aine, thanks a lot for your nice words, you are very dear and I really hope to see you again! This year it was a great experience to be a guest again at Gianni in Cerqua Rosara. And a guest you are! Gianni knows how to be an excellent host welcoming you in effortless style and make the stay memorable. With his exuberant impact he organizes a weekly cozy (naturally noncommittal) BBQ where you can meet the other guests while enjoying fine wine and good food. People with culinary heart are well catered for. Umbria include the region of olives, truffles and wine. Gianni example you can point the way to an authentic olive press where you can buy delicious viscous oil that you will not find in the supermarket. This year his nephew came along with fresh truffles he had found a day in the woods. He sells them to restaurants in Rome, but first came along at Cerqua Rosara. Not to get rid of its truffles, but to see them, smell them and to tell about. Then you get the chance to buy some at a friendly price, including some tips on how to prepare them in case you don’t know. We did not expect our children would find it so tasty! Gianni also can give you tips to visit vineyards in the rolling Montefalco region. There you can then buy your wine from the chateau, often including educational tour. The property is beautiful, luxurious, very spacious and child friendly. The pictures on the website give a good impression. The very large house is divided into apartments of various sizes. The spacious layout and good insulation keeps the apartments cool and the neighbors won’t bother you. We have met nice families from all corners of Europe. This year, Gianni has set up a corner of the site as sort of petting. He has three donkeys, a few geese, rabbits, ducks, not to mention many chickens! That ensure supply of farm-fresh eggs (nice for the truffle;-)). For the children and for us it was a feast! The apartment is fully equipped and it is quite beneficial in Umbria to make day trips from there. Often we went in the morning on the road to one of the many sights to see and then enjoy an extensive Italian lunch in the authentic towns / villages. Compared with Tuscany Umbria wilder, less touristy, less crowded and more friendly priced. A great place to return to! First time we visited Cerqua Rosara in 2010 in August and returned in next years four times in May and June. We conifmed our previous filling we found the unusual holiday site. Comfortable, clean and modern equiped houses like Cerqua Rosara you can find in Italy probably quite easy. Even you expect peaceful and well situated place for visiting most interesting historical and natural Umbrian's points with huge, panoramic environment, beautiful very old oak trees and realy clean pool. Exceptional in Cerqua Rosara is the owner. We spent in Italy holiday every year from nineties - sometimes two times a year - but we never met the person as resposible, solicitous for visitor's feeling, helpful in every necessity as Gianni. We never before found the owner so engaged in permanent improvement his country house to be every year more comfortable and useful for guests. We are sure that visiting Cerqua Rosara you will be not disappointed. Valtopina famous for its exhibition National truffle, Assisi linked to the name of San Francesco, Perugia with its museums and a wide range of cultural, Spello for its Roman origins, Montefalco for its wines, Trevi counted among the best towns Umbria, Spoleto for the Festival of Two Worlds ............ and many other medieval towns and villages to visit all with extreme comfort and a short drive with journey times between 15 and 45 minutes . Book your stay in Cerqua Rosara Residence! SPECIALE ! Invita i tuoi amici a trascorrere una meravigliosa vacanza presso Cerqua Rosara Residence: gruppi (sino a 18) e lunghi soggiorni danno diritto a sconti sino al 20 % . Contattaci !